Big city. Big style. Discover knitting that's fashionable yet timeless. Knit for uptown or downtown with a trend-setting New York City designer. 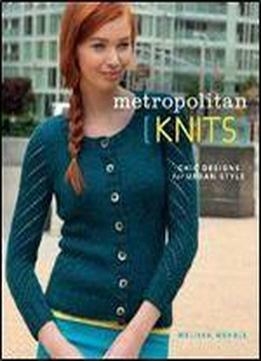 With these 20 polished, sophisticated projects, knitwear designer Melissa Wehrle has created a collection that perfectly reflects the rhythm, flavor, and drama of city life. From a chunky cabled sweater and hat to a beautiful tunic and gossamer cardigan, Melissa's designs are beautifully shaped, expertly finished, and ready to be shown off on the street. They feature a variety of construction and finishing techniques, including knit-in pockets, tabs, button details, slip-stitch edgings, and small slits and pleats. Projects are divided along three themes:Heart of the City- Designed for those who enjoy sleek midtown in mind.Urban Bohemia- The downtown bohemian goddess will love these looks.City Gardens- Made to inspire a sense of tranquility.These three looks balance out a complete picture of the modern woman. What more could a city knitter need?